The lives of those living in Latin American have evolved dramatically over the last couple of decades. From a starting point of centralised economies led by left-wing dictators, most societies have ended up embracing political and economic freedom. This democratisation process brought peace, stability and rapid growth which, together with a long cycle of high prices for commodities, meant moving the whole region from the very bottom to a league of ‘middle income countries’. Some countries even joined the ‘exclusive’ OECD (Organisation for Economic Cooperation and Development) club. In Chile, for example, development indicators, such as personal income or college enrolment, grew six-fold in just three decades. Besides the obvious reasons to celebrate, economic prosperity also brought unexpected consequences. The new middle-class generations became wealthier, more educated and, thanks to new technologies, better informed and empowered. Now they are questioning the status quo and pressing hard against those leading politics and corporations. In the last decade, these claims have been successful in mobilising change, such as tax and labour reform in Chile; pension reforms and upheaval in indigenous communities against mining in Peru and key government officers in at least seven countries facing jail, related to corruption schemes implemented by Brazilian corporation Odebrecht. 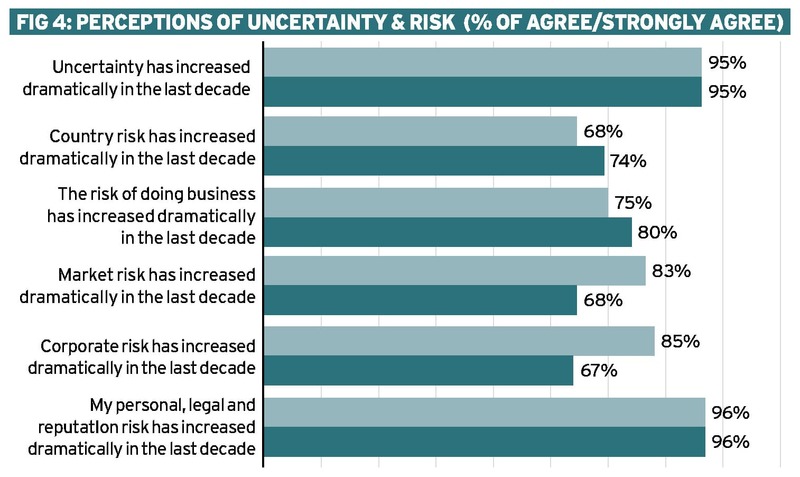 Directors in the region are feeling the pressure for change, too, and the words ‘uncertainty’ and ‘risk’ are conjugated in boardrooms more than ever. In order to better understand this phenomenon, I was asked to help conduct a series of interviews and surveyed more than 500 CEOs and board members of the largest corporations in two countries: Chile (which ranks top in terms of economic and political transformation) and Peru (which ranks in the regional average). While the survey data comes from just two nations, for someone teaching and advising boards across the region, the findings seem to be quite representative. In the early 1990s, the US Army War College introduced the acronym VUCA (Volatile, Uncertain, Complex and Ambiguous) to describe the new world that emerged after the end of the Cold War. It was harder than ever to predict the nature and dynamics of change (thus, Volatile); the lack of predictability, awareness and understanding of issues and events (Uncertain); the multiplex of forces, the confounding of issues, no cause-and-effect chain and confusion surrounding organisation (Complex); the haziness of reality, the potential for misreads and the confusion of cause-and-effect (Ambiguous). VUCA seems to be a precise description of how Latin American board members perceive their region has evolved in the last decade. First, they feel very strongly that institutions, laws, regulation and rules of the game, in general, changed dramatically during the last decade. Moreover, while the degree of change was perceived unanimously, the actual direction of change had different interpretations. For example, a group of directors perceived pieces of regulations, such as those protecting the natural environment, as extra burdens and costs. Others perceived those same regulations as a positive and necessary convergence towards international standards. New rules of the game generated passionate debates over the ways firms should change and adapt to them, but also created uncertainty regarding the ways regulators will eventually interpret and enforce the new policies (see Figure 1). CEOs and directors also acknowledged dramatic changes in their economies and civil societies in the last decade. Wealthier and better educated populations brought growth and business opportunities, but citizens became more demanding. Moreover, institutional investors, consumer associations, NGOs and local communities were amplifying their voices and increasing their relative political power. CEOs and directors realise that the long-term prospects of their corporations will depend upon their understanding of these social expectations (see Figure 2). 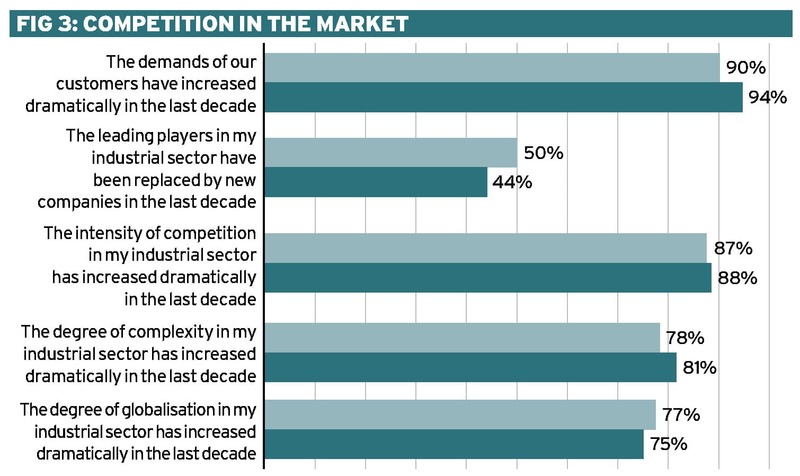 Directors of the board also perceived significant change in the markets where their firms competed. On one side, customers were more demanding, more complex and harder to understand and serve. The traditional segmentation schemes were obsolete and the new middle class ‘millennials’ were particularly difficult to decode. On the other side, market growth, economic freedom and technological innovation brought new competitors and new business models. Those firms relatively accustomed to operating in protected markets, were suddenly disrupted by new, sophisticated and aggressive global competition (see Figure 3). in their view. This datum underlines the difference between perceptions and reality and how environmental change is affecting the former. As a matter of fact, the country risk ratings of these countries consistently improved in the last decade. Informed consumers, technology-induced transparency and more empowered citizens were also affecting the job security of those sitting on boards. It is not a coincidence that the last decade revealed more corporate scandals than ever in history. In Brazil, for example, the CEO of the largest construction company Odebrecht and one of the richest persons in Latin America was sentenced to 19 years in jail, following corruption charges. The Mexican Walmart bribery scandal ignited an expansive wave that spread not only to the global giant’s headquarters in Benttonville but also the boards in Latin America. In Peru, the chairman and the CEO of the giant contractor Graña y Montero resigned their positions to deal with accusations of corruption. In Colombia, an embezzlement scandal at its main oil refinery, Reficar, became the country’s biggest scandal ever, with $4billion missing and a $16million prostitute bill. In Chile, the chairman of the board and two senior executives of retailer La Polar went to jail charged on a billion-dollar accounting fraud. Accordingly, for almost all directors in the sample, their personal risk, both legal and reputational, were perceived as higher than ever (see Figure 4). How did all the above-mentioned perceptions affect strategic decision-making at the board level? Did boards see opportunities or only threats in the social and market changes? How did their companies’ strategies reflect their perceptions? We classified strategic responses in two dimensions. First, we measured the perceived potential effects of change and classified the answers in an ‘optimist-pessimist’ axis. 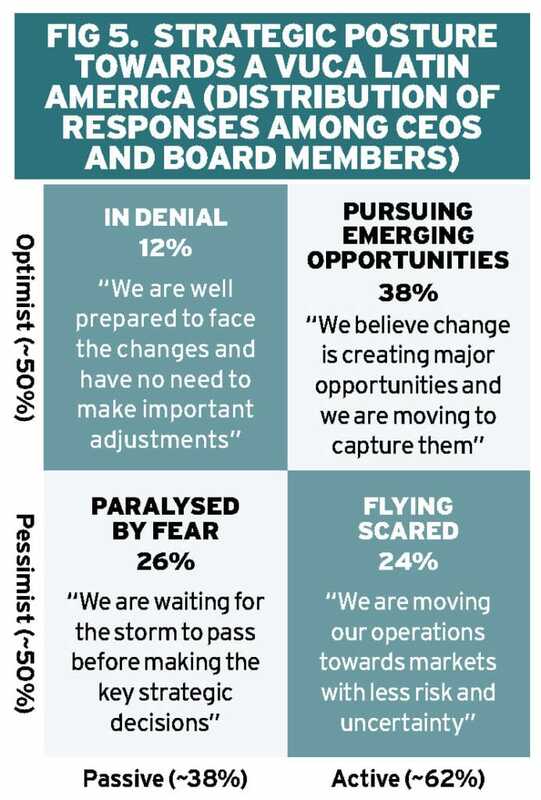 Those that perceived new emerging opportunities arising from shifts in the environment or just saw no clear negative effect on their companies were classified as ‘optimists’. The second dimension, defined as ‘active-passive’, considered if their companies were driving or not specific initiatives and capital expenditure to face the new situation. These initiatives and projects could be either offensive, pursuing opportunities, or defensive to mitigate the negative effects of change. The results were striking, as barely two thirds of companies were not able to see clear opportunities in the new milieu (see Figure 5). Until now, Latin American boards have been extremely resistant to the outside pressures to change their practices and composition. For instance, a recent study showed that the current percentage of boards seats held by women in Latin America is 6.4 per cent and that since 2011 these proportion grew only two per cent per year (one third the speed of their peers in US/Canada and one seventh that of Europe). However, the stress induced by the speed and nature of change may be melting resistances and facilitating a more rapid adoption of best practices. 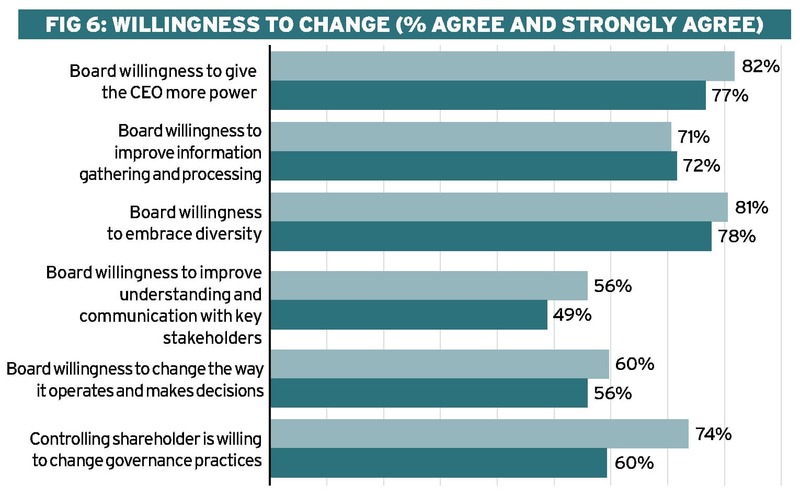 In that sense, our survey inquired on the willingness to change at board level. Apparently, directors are now very open to changing board practices. From their processes to their relationship with the CEO, even diversity was less of a taboo (see Figure 6). In the last 30 years, Latin America has changed dramatically in just about every dimension. Economic and political freedom brought peace, prosperity and globalisation. Like their customers, local corporations grew richer, more sophisticated and faced new challenges and opportunities. Yet, their boards of directors seemed oblivious of the tectonic shifts. Now they are struggling to make sense of the new situation. They are surprised, uncertain and defensive, but also more willing to listen to key stakeholders and explore new ways of doing things. It is still too soon to tell if these processes will end up bringing real change in Latin American boards, but a VUCA world is a great reason to start. By Professor Alfredo Enrione – Founder & Chairman of the Center for Corporate Governance and Society at ESE Business School and Chancellor of the IAOM.